On the background drawing above you see hotel De Boer, now hotel Dharma Deli. 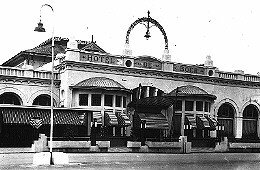 The beautiful courtesan and oriental dancer, Mata Hari, was a guest in the hotel once. Her young son was poisoned and buried in Medan. Mata Hari (her real name was Margaretha Geertruida Zelle) was born in Leeuwarden, The Netherlands, on August 7th, 1876 and married a colonial army officer at the age of eighteen. She then lived in the Dutch East Indies until her separation in 1902. Later she became an oriental dancer in Paris in 1905 and fabricated an entire past for herself, including royal Javanese ancestry. She used the stage name Mata Hari, which is Malay for Eye of the Day, or the sun. Mata Haries intelligence, facility for language, and connections with people in high places, made her ideally suited for espionage, and, with the coming of World War 1, her services were sought by both the Germans and the French. The French suspected her of double dealing but at her trial she claimed to have purposefully passed valueless information to the Germans. No concrete evidence has ever proved otherwise. She was convicted as a spy and executed at Vincennes on October 14th, l917.